Our 8Yard Maxi Skip is slightly larger to our 6yard skip and is mainly used for building projects and large household clear outs. It can hold roughly 70 black refuse bags and is suitable for large bulky items, garden waste and soil/stone. The maxi skip can hold between 60 and 80 black bags full of waste. This is more than enough for an average house clearance or refurbishment job. This size skip is mainly used for building projects and large house clearances. It is perfect for bulky items, garden waste, and can be used for soil and stone too. Whatever type of waste you need to get rid of, our Maxi sized skip is perfect. Just fill it up and we will take care of everything else. 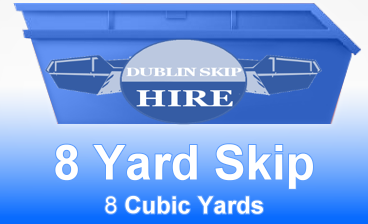 The Maxi Skip is 8 cubic yards in volume which is more than enough for the average refurbishment job. Furthermore, you can place all your building waste in it. If you would like any further information about our skip hire services, just click on the contact page. One of our expert staff will be in touch straight away to deal with your query. If you are happy to place your order now you can do so from this page and we will be in touch to organise delivery at a time and date that suits your needs.